Take me to the Farmers’ Market, ANY Farmers’ Market, and I’m like a kid in a candy store or a country girl in the big city. The sight of fresh-from-the-farm produce, artisan bread or handmade jewelry gets me every single time. So when my friend Natalie and I ventured to the Newark Co-op Farmers’ Market one fine Sunday afternoon, I was blissfully giddy. The number one reason I enjoy the Farmers’ Market is because I get to talk to the people actually growing the food I eat. They grow it, harvest it, and I am making Sunday dinner with it that evening. Since I’m new to this whole grow-your-own-food thing, this concept always astounds me! 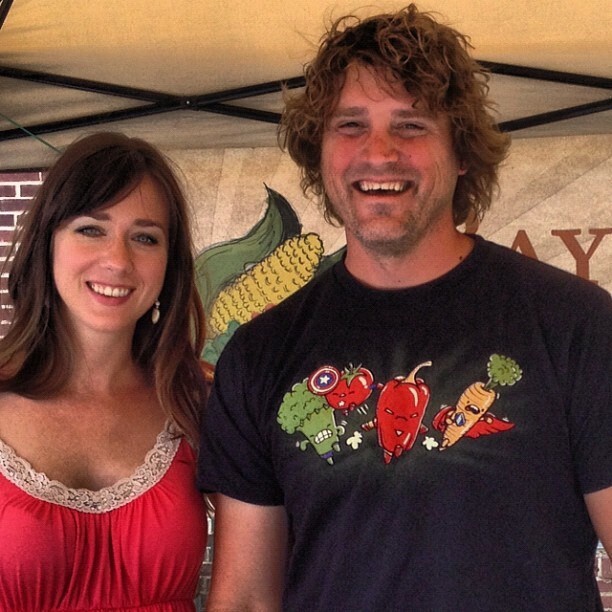 So when I saw Toby from Bayberry Farm (my CSA farmer) I felt like I was meeting a celebrity (I’m not exaggerating). I mean, this guy grows the food I eat. He had dirt underneath his finger nails (a very good sign) and chatted about the farm while wearing an epic T-shirt depicting vegetables as various Avengers characters. A great start to market day! A close up of Toby’s T-shirt. Do I look starstruck? Taking a preview trip around the market, I saw a pizza oven on a truck (yum! ), lovely jewelry for sale, farmers displaying their hard work in tangible vegetable form, cute kids playing violins, bakers wafting the scent of fresh bread through the market air, and families enjoying the sunshine and community. The other observation that struck me was the friendliness of the vendors. They are not at the market only to sell fresh, local food or goods. Instead, they want to get to know you. They also want you to know about them, what they sell, and how it’s produced. Everyone was so friendly my cheeks hurt from smiling so much! Taking a break from the smiling and the chatting, Natalie and I enjoyed a ginger lemonade from Nature’s Juice Stand, which sells only healthy, raw, 100% organic juices, salads, and lemonades. 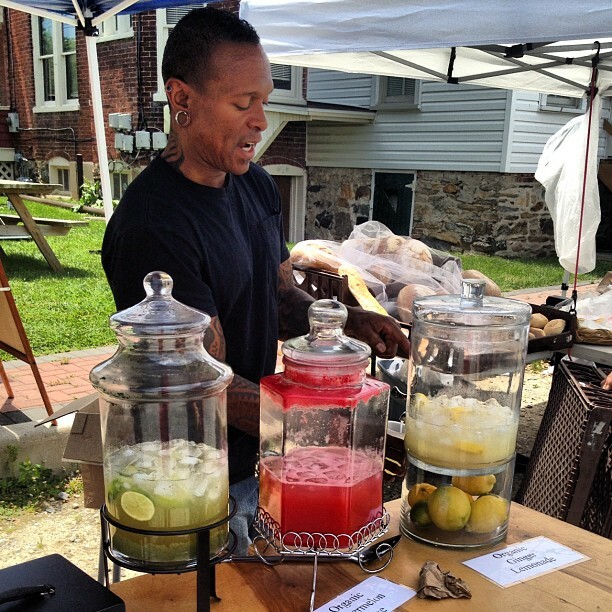 The ginger lemonade was FANTASTIC! Next time, I’ll try the watermelon juice. Big Sky Bread Company. They have a cafe in North Wilmington! Since there are too many outstanding vendors to mention, I suggest you head to the Newark Co-op Farmers’ Market this Sunday to see for yourself. While you’re at it, buy a handy and perfectly sized Newark Natural Foods tote bag to fill with all the fresh veggies, fruits, breads, spices, and miscellaneous items you will surely need to take home with you. Natalie bought me one for $1.50 and I’ve used it every day since. Open every Sunday from 10 am to 2 pm. See you there! There is nothing like a farmer’s market to brighten up your day! It’s so true! I’m instantly in a better mood when I’m at one. Such a good vibe at this particular one, too. I’d love to eat local, but I live in Canada. In the winter, this would involve eating snow. Any tips? Snow ice cream? I think it will be hard to eat locally here as well. I am getting a farm share for January to February but I think it will just involve potatoes and root vegetables. Not much fun. I’ve heard there’s this thing called canning which enables you to store your summer veggies. 😉 I haven’t tried it yet though. I’m just getting the hang of this local thing!